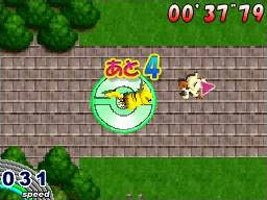 Take control of Pikachu as you race against other Pokémon, hitting all of the checkpoints in order. Pikachu runs in the direction you scrub the stylus, across road, grass and snow. Find speed pads to cross forests and deserts, ride Lapras across the oceans, and launch yourself into the sky by collecting balloons. Each 'Cup' takes place on the same map, but the checkpoints move and increase in number for each race. Up to six players can take part in wireless multiplayer races.